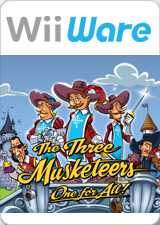 In The Three Musketeers: One for all! the Three Musketeers have been imprisoned by the treacherous Count Xavier and his sinister lieutenant Count Orsini! Well, almost – take on the role of Porthos, famed member of the Musketeers, to save the day in this swashbuckling platform adventure inspired by the classic novel. Swing the Wii Remote to launch blistering sword attacks on your foes, avoid fiendish traps, and discover hidden collectables. Packed with frenetic fencing, heroic leaps and fun puzzles this is one adventure no aspiring hero will want to miss! The graph below charts the compatibility with The Three Musketeers: One for all! since Dolphin's 2.0 release, listing revisions only where a compatibility change occurred. This page was last edited on 22 January 2018, at 02:28.